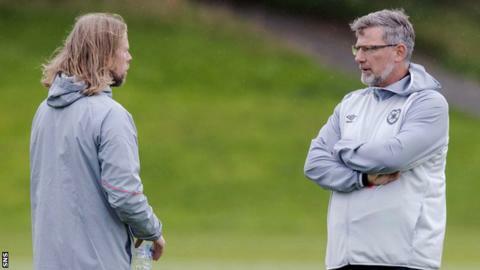 Hearts manager Craig Levein has returned to work two weeks after he was admitted to hospital. Levein, 53, watched the club's reserves beat Hibernian at Oriam and will observe first-team training this week. Saturday's match at Motherwell had been targeted for his dugout return, but a decision has yet to be made on whether or not he will take charge at Fir Park. The former Scotland boss spent two days in Edinburgh Royal Infirmary's coronary care unit. Hearts' second string won the match 2-1 at their training ground in Edinburgh and first-team players Arnaud Djoum, Harry Cochrane, Anthony McDonald, Oliver Bozanic, Danny Amankwaa and Craig Wighton all featured from the start. Last week, Levein tweeted: "I'd like to thank the paramedics and staff in the CCU at ERI for their care and professionalism. "I'd like to thank the professional footballing family for their amazing support. It's been overwhelming."